Mercedes driver Lewis Hamilton has been "close to perfection" in the first four grands prix of the season, according to former world champion Nigel Mansell. 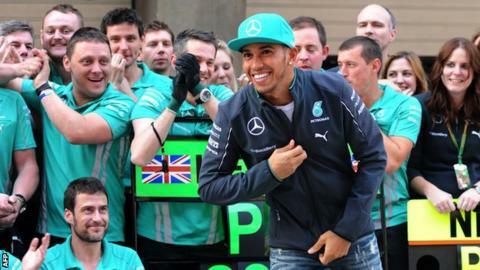 Briton Hamilton, who won the world title in 2008, has won three successive races after failing to finish the opening grand prix in Australia. "No driver ever wins a world title in a bad team, but what you can do is demonstrate how brilliantly you can win," Mansell, 60, told BBC Sport. "Lewis has done that this season." Hamilton made a big impression when he made his Formula 1 debut for McLaren in 2007, narrowly missing out on the title. The 29-year-old won the championship the following year but has struggled to build on that success, failing to finish higher than fourth in the standings. But since leaving McLaren for Mercedes last year, he has looked back to his best and is making the most of a superior car this season. "He has been close to perfection, just brilliant," said fellow Briton Mansell, champion in 1992. "He has been given the freedom to express himself. "When you get a few more wins under your belt, you get even more confidence and that gives you another half a second in your pocket. "It doesn't get any better than knowing you have a good car - it's the most wonderful feeling." Hamilton trails Mercedes team-mate Nico Rosberg, who won in Australia and has since had three second places, by four points in the standings. Mercedes are running away with the constructors' championship, already leading the chasing pack by 93 points, almost the equivalent of four race wins. "They are the class act of the field in 2014," added Mansell, ahead of this weekend's Spanish Grand Prix. "I don't see them dropping the ball. "They're not going to be unbeatable during the year, but I think it will be very hard to close the gap because of their superior engine performance. "Lewis and Nico are going to have a tremendous time in 2014."